The tarot was designed to be a universally recognizable and complete set of images of transformation and transcendence. This new and radically primal set of images is designed as an antidote to all the various subjectively idiosyncratic versions of the tarot that now exist. Even the the most accurate tarot decks still limit themselves to the meanings of Earth human experiences. As a result, in using these tarots, the knowledgeable operational range of Being beyond the human is effectively circumscribed. The ZeroInfinity Tarot, like the I Ching, is derived from a deeper logical and intuitive level of consciousness. Its simplicity and mathematical completeness allows for a clearly comprehensive understanding accommodating all existing systems, as well as allowing logical expansions into realms beyond any current symbol sets. One of the conscious work aims of all transformational art here is to generate impressions in the human consciousness that will actually attenuate the oscillations of the mindstuff so that the "mind" will reflex into the repose of its natural impressionless state. As the Zen saying goes, "The Best Mind Is No Mind." 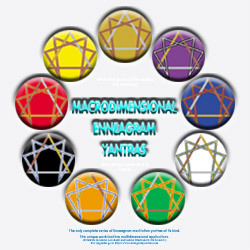 To read what people are saying about the Macrodimensional Enneagram Yantras, please go to the Testimonials page. To begin, the background colors of the circles represent the various "Hallways" as described in the New American Book of the Dead and Angels Healing Journey, by E. J. Gold. In the Tibetan terminology, these are "the stages of Bardo." The relationships of the "bright lights" or "skandhas" to the "organic world reverberations," or "lokas", are taken from the Book of the Dead assignations. But it must be reiterated that the underlying root of these teachings relates to every moment of life, and not just to that portion of existence beyond cessation of identification with the organic matrix. 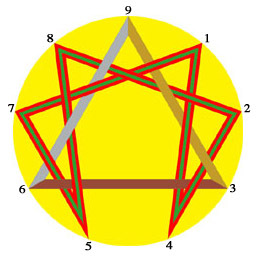 One possibility that is represented in Series 1 of the Macrodimensional Enneagram Yantras®© is the manifestation of a logically consistent and complete progression of how the components of consciousness relate and interact producing various types of existential situations such as "lifetimes", "between-lives states", "dream states", "awakening", "Creation, Uncreation and Transformation" and whatever else the hominid bipeds on this cosmic dust-speck have dreamed up to supposedly suffer about and transcend - basically from Nothing to Everything and Everything to Nothing. A fully functioning sense of humor is vital for the voyage. Don't leave Home without it. Better yet, don't leave Home! But it's best not to give away the punchline before we even know what the joke is, right? Therefore, there would be 8 X 7 X 6 = 336 yantras for this progression. This demonstrates one complete octave for each set of relationships as the energy slowly spirals down towards rebirth or up toward the Unconditional Clear Light of the Void. Without going into any details concerning these events, it can be stated that each yantra can act as a conscious resonating reference to a specific state of consciousness. Yantra in this context refers to a technical term denoting mode of being seeing. Empty relational forms indeed!..... Beyond these secondary and tertiary color relationships are the 27 primary copper, silver and gold fields representing the 3 vehicles of Enlightenment - Creation, Transformation, Transcendence. In essence each aspect of the yantras is enfolded within and unfolded from all the others. True magic theatre. Enough said. Color has an irresistible effect on all of life. The faculty of producing color from the interaction of dark/light varies proportionately with every nervous system and how conscious the operator of said system is. Undoubtedly the actual sensing of color differs from individual to individual. So each individual doesn't sense the same color in the same way as another. The meaning given to any color may vary just as much from viewer to viewer. Thus the type someone manifests will also determine this one's experience of a particular color. The same color may produce diametrically opposite results in different types, or even in the same person at different times under different conditions. This is due solely to the fact that any color which becomes dominant to the exclusion of all other color is just a part parading around as the whole. This is called the imbalance of partiality. Only when all other colors are seen equally in each individual color is there true balance. To bring about this balance one must be cleared of all tendencies of attraction/repulsion for a color or combination of colors which relegate one to a certain type. The way this clearing is possible is through exposure to all possible color combinations and permutations all-at-once. This all-at-onceness is that which makes possible the simultaneous knowing of another being's exact experience as that being. This happens because one has given up identifying with one's "own" coloration and has allowed the flowing back into the all. But instead of being swallowed up in this allness, one only becomes oneself - only more so - because this one is all, as well as being one which is neither the same nor different. (The appearance of "sameness" or "difference" is what produces the so-called "coloration", even though in reality, all is clear). To fathom all color one must be clear.